Things that make my day! 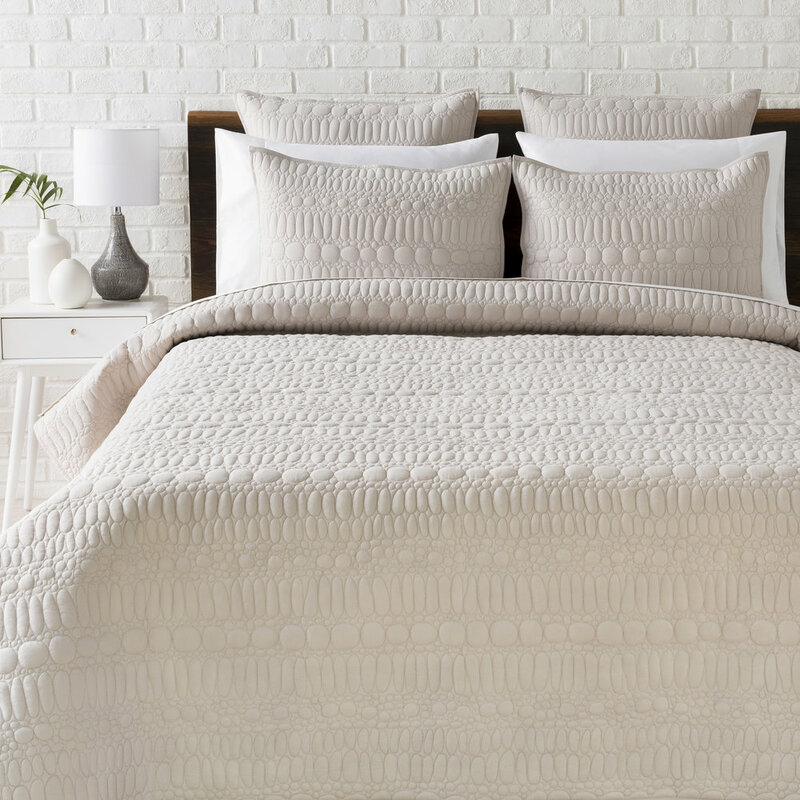 My modern organic Pebble Quilt set was among Surya’s Top 5 Best Sellers in the bedding category from this season’s High Point Market! As a designer, it is always validating to know that your designs have resonance. I heard from so many High Point Market attendees, Interior Designers and Retail Buyers who saw the quilt set in the Surya Showroom, expressing excitement about our newest bedding design. It has such a quiet yet elegant presence. Soft, neutral color ways enhanced with a unique organic tone on tone stitching that originated as an ink and watercolor design from my art portfolio. No bold colors… no on trend florals,… and yet…it still caught their eye;) I believe its appeal is that the quilt holds its own and looks great as is on a bed, but it also layers in beautifully with other bedding, making it a versatile investment for your bedroom decor. This is a personal success for me, particularly sweet as my design studio has been very close to bringing this quilt to the marketplace before. Thanks to Surya’s team, I was able to finally bring this vision for textural, tactile, neutral bedding to life in such a beautiful way. You can shop the full Shell Rummel Surya collection here. Q: Would you share yourself with us? A: I’m Shell Rummel, an artist and designer whose art and design studio is located just outside of Washington DC. I have an extensive fine art portfolio, having worked as a professional artist for nearly 20 years. Watercolors are my chosen medium and the unpredictable quality of painting with water suits my love of fluid, organic shape and line. I often detail my works with ink to add intricacy and depth and this has become a signature style for my work. I have a passion for textiles arts and as a designer, I am proud that through licensing my art, my designs and patterning can be found gracing a large variety of home décor products such as rugs, pillows, bath and bath and textiles, via the Shell Rummel brand. Q: Your paintings are full of organic lines and layers of color. You’ve said that your inspiration is all things from the natural world. Where do you get the inspiration the most, sea, shell, tree or something else? A: Inspiration for a painting comes from many unexpected places but more often than not, there is a connection to elements found in nature. It’s no surprise that I am drawn to the water, specifically the ocean, and often pay homage to it via my paintings and design work. I paint what I feel more so than what I see…and nowhere is this more evident than in my modern coastal inspired artwork which tends to abstract natural elements into line, pattern and shape. The things that most often catch my eye? Many a seashell, oyster, tideline, variegated rock and seagrass have inspired my work…I try to pay tribute to the details of their distinctive organic shapes. Q: It seems you like all kinds of blue and green colors a lot! Why do you like these colors? How do these colors make you feel? A: My go-to color palette includes watery blues and greens offset by neutral greys and browns. There is a grounded calmness to this combination of colors that I find very soothing and of course, reminds of the ocean I love so much. I was interviewed by the fabulous CylCollective women's group that I joined early this year for a quick Q&A over on their blog. Click the picture above to read my words that were shared with my CYL squad. Love this group! The women inspire me everyday with their creativity and their voices. Most are considerably younger than me, but I find their confidence and openness to be so inspiring. They are strong, empathetic, kind, helpful and giving... women helping women...Woman, at her best. For all of the women creatives who are following me on this journey, I invite you to join this group and see for yourself how finding a tribe can push you further, within and out of your own comfort zones. Member enrollment opens up again next month so follow @cylcollective on Instagram and keep eyes open for the new membership dates...feel free to mention that I sent you! I'll be posting about membership again as it gets closer. Have questions? I am happy to share my own experiences so far with you... just ask.